I have always wondered if there is anything left in the neighbourhood from Shakespeare’s time, when his plays were performed here at “The Theatre” and “The Curtain Theatre” in Curtain Rd. The Norman church of St Leonard’s Shoreditch that he knew was demolished in the early eighteenth century but I heard a story that a door from the church had been preserved, a door that Shakespeare could have walked through. When I spoke to the Reverend Paul Turp, he confirmed that the new church had reused much of the material from the earlier building and that the paving of the portico included twelfth century stone. In fact, he believes the current building was constructed using the floor of the Norman church as its foundation, and the tombs of the Shakespearian actors are buried down below, just waiting to be rediscovered. My enquiry became the premise for an exploration, and when I met the beguiling Rev Turp on the steps of the church, he handed over a flashlight, a single gesture that filled me immense anticipation. Standing there on the porch in the afternoon sunlight, the Rev Turp began by conjuring a picture of the moment the Roman army arrived on the other side of the road to secure a source of fresh water. This was the wellspring of the River Wallbrook at the junction of Shoreditch High St and Old St. From a camp here at the crossroads, the Roman army controlled England and Wales. The road West led to Bath, the road North led to York, the road East to Colchester and the road South to Chichester. When I heard this I realised that Old St truly is an old street. The Anglo-Saxon word “suer,” meaning stream, gave the neighbourhood its name “Shoreditch,” and it was this stream that undermined the old church, leading to its demolition. 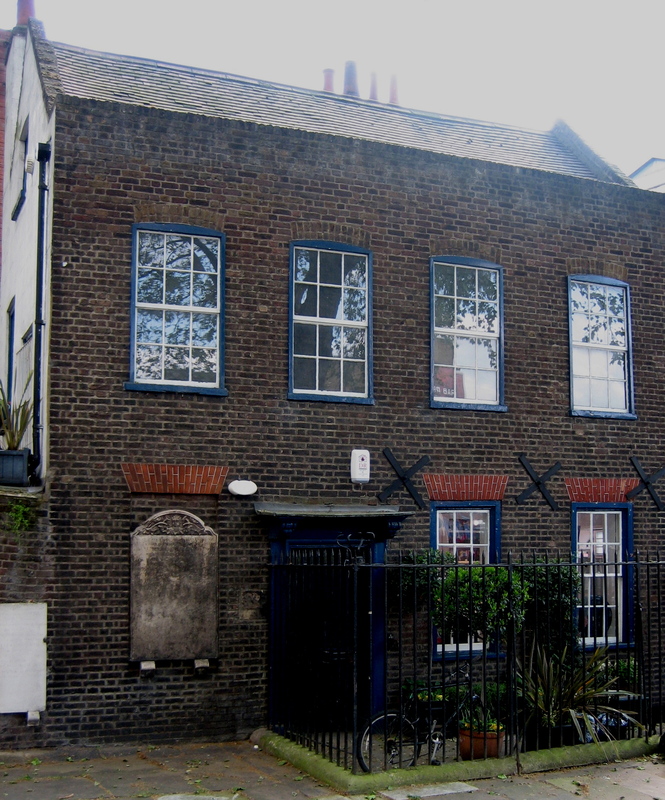 Even after the building of George Dance the Elder’s church in 1740, there were problems with flooding and the ground level was built up to counter this. Only the top three steps out of the ten at the front of the church are visible now, the rest are underground. Similarly, the lower crypt was filled to stabilise the structure, which is very frustrating for the Rev Turp because he believes that the floor of the lower crypt is the floor of the Norman church, where the tombs of the Shakespearian actors are. This is the floor that William Shakespeare walked upon, whenever he came for services, weddings of his fellow actors, or when his brother Edmund‘s son was buried here in 1607. As I stood in the depths of the crypt with the Rev Turp, beneath a dusty brick vault, peering down to the mysterious lower vault that has been filled in, the physical space came to manifest the distance between us and Shakespeare’s world. The Rev Turp wants to excavate through the layers of rubble and human remains to reach it. “If I can find a stone with the name Burbage on it then I shall be satisfied,” he confessed, referring to the joiner James Burbage who built the first theatre in Shoreditch and his son Richard who was the first actor to play Romeo, Hamlet and Richard III. We were standing in the underworld of the imagination, it was packed with the dead, though just a fraction of the more than seventy-six thousand buried at this site. 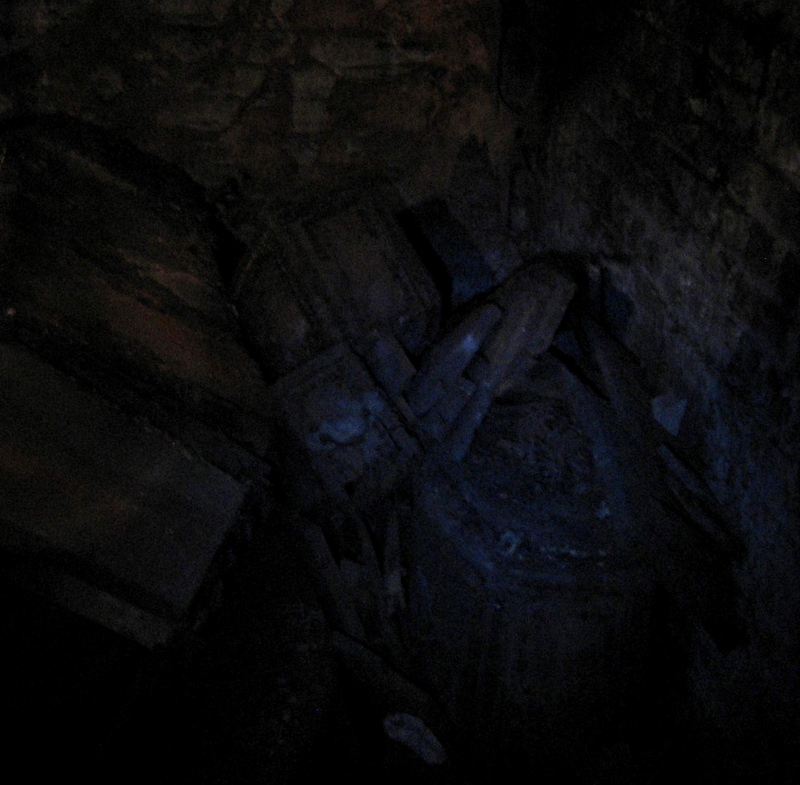 We peered deep into small family vaults on each side, where piles of coffins had collapsed upon each other, broken open over time, creating a mishmash of bones. 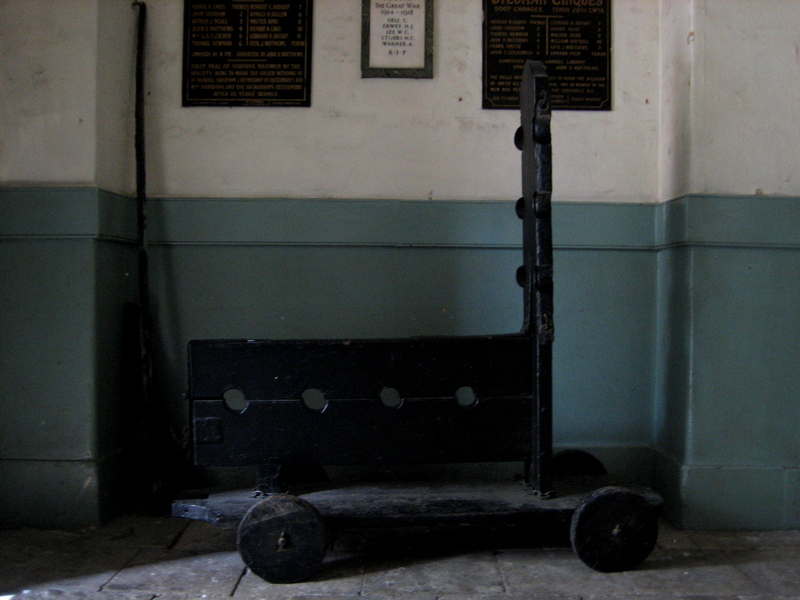 Many coffins were discovered to have been filled with bricks, indicating the undertakers had sold off the bodies before burial – though fortunately the families of the dead were none the wiser. We gazed through a large central vault where, beneath a surface that resembled dunes, countless layers of coffins were stacked up yet broken in upon each other to create a morass of unknown depth. 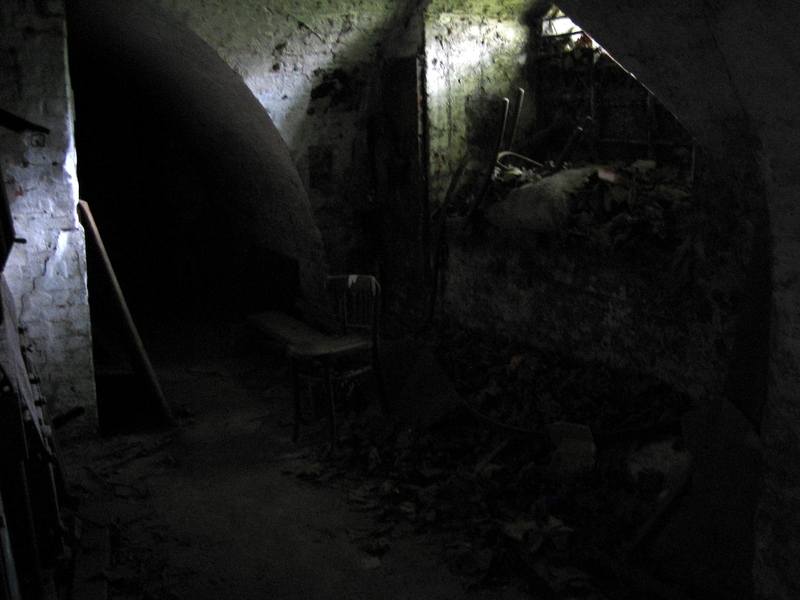 Under the porch, on a level with corners of lead coffins sticking out from the surface, we were literally walking upon the dead. The Rev Turp told me tests were done to check whether the remains of those that died of smallpox still presented any risk of infection today, and I was reassured to learn that although the virus was present, it was inert. Once I saw the old door, I was disappointed at first, though I tried to hide it from the Rev Turp. The door was tall and narrow, with panels that appeared eighteenth or nineteenth century in style, not the wide medieval church door I had envisaged. The Rev Turp explained it was from a side entrance, but I began to wonder. 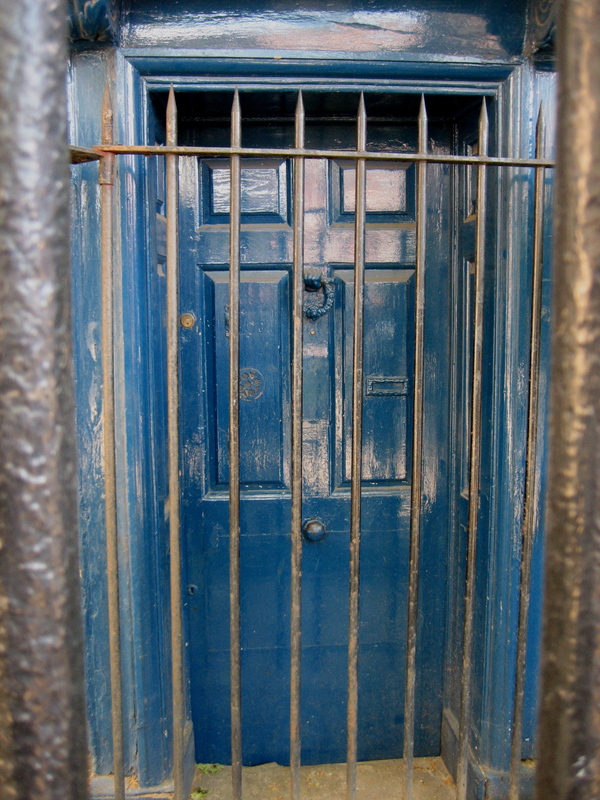 Not only were there two layers of railings between me and the door – which was locked – but even if I was able to walk through it, could I accept that this door that was around in Shakespeare’s time? Then something unexpected happened, by chance the resident of the Clerk’s House arrived home at that moment and, without thinking twice, I leant through the railings to ask if I could see the reverse of the door. He said “Yes. Come in.” So, leaving the Rev Turp standing, I ran out of the churchyard gate and into the gate of the Clerk’s House – and through the door. At once, I could see from the back of the door that it was ancient, with primitive iron hinges, and acceptably medieval in its robust contruction. Then my host showed me old panelling, also incorporated into the building, at the top of the stairs, of proportion and construction that was of the renaissance or earlier. 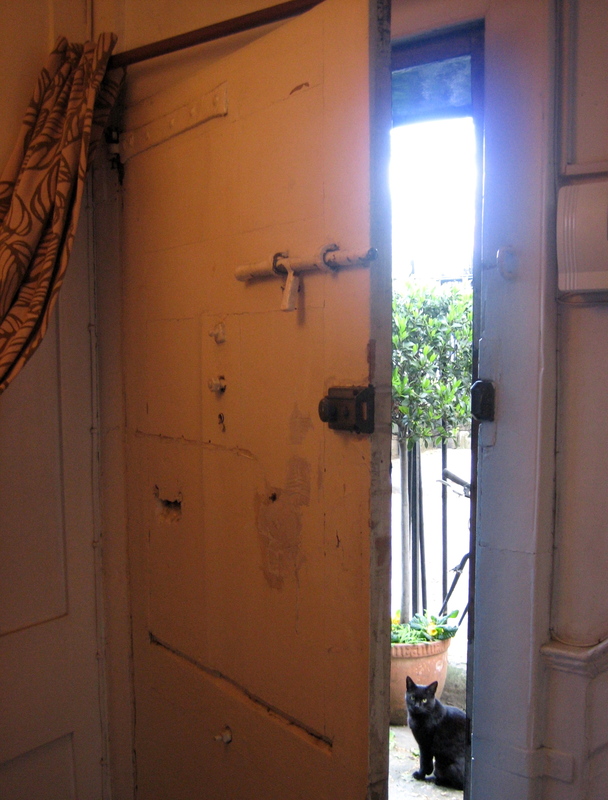 Now I was persuaded of the history of the door and, as I stood to take my picture, looking out from behind the portal to Shakespeare’s London, a black cat ran down the stairs and out of the door, turning to look back at me, as if in confirmation of my good luck at this discovery. What a great treasure hunt! I was hooked as soon as I started to read the article!! Fascinating! A suspenseful story from ancient times …! Well written GA, and all with one finger I guess, a fascinating story ~~~ again!! truly a transcendent piece, that collapses time, moves through portals, shifts perspective by passing through a door, and wraps eternity around the ticking clock of our own time….. Thank you for this peak beneath the church of St Leonard’s. I’ve always been intrigued to see what it might be like after reading of my 2x great-uncle being buried there in 1828. Now I know! Hi Robin you may not remember me I’m a friend of peter Woodcock I would like to contact him but have lost his number I wonder if you have his number. I hope you are well.Best Wishes Michael Wadd.